A busy week of Premier Development League (PDL) play has been completed and the race for the PDL Southern Conference Mid South Division’s two playoffs spots is still as competitive as it was at the beginning of the week. AHFC Royals, who won a big match against 10-man OKC Energy U23 on Friday, retain their hold on first place in the division with 18 points, though they have played more matches than most of their closest competitors. Corpus Christi FC made the biggest jump this week by registering two home shutout victories to move into second place, two points off the lead. The disparity in matches played to this point changes the playoff picture when viewed from a points per game (PPG) basis. From that perspective, Texas United and OKC Energy U23 would have a slight edge over AHFC Royals for the Mid South playoff spots if the season ended today-though both of the PPG leaders and Brazos Valley face a daunting schedule with 7 matches to play before the regular season ends on July 15. The Mid South currently has three of the top ten goal scorers in the National PDL. Texas United’s Julio Vargas is tied for second with 9 goals. OKC Energy U23’s Matt Puig and AHFC Royals Killian Colombie are tied for 5th with 8 goals each. Week 9 brings five matches, capped by Corpus Christi FC’s trip to Oklahoma City to play Energy U23 on Saturday. The Cavalry will look to pick up points with two home matches this week, before they head north for a three game stretch to face Energy U23 and both North Texas teams. OKC Energy U23 also has two games this week, one of them will be an out of conference match (designed to balance the league-wide schedule) against Kaw Valley FC. Tonight will see the rematch of the North Texas rivalry between Texas United and FC Cleburne. Two goals by Miguel Velasquez led the Cavalry to a 4-2 away victory over AHFC Royals in Houston. Brazos Valley returned the favor after the Royals had beaten them in Bryan a few weeks ago. Three first half goals by different scorers was the difference as FC Cleburne defeated the Sharks 3-1 in Cleburne. A Matt Puig first half hat-trick and five goals in the first 30 minutes was enough for OKC Energy to rout Houston FC. Puig also had an assist and scored his 3 goals on only 4 shots. This was the final home game of the season for Houston FC. Thomas Haney and Killian Colombie of AHFC Royals scored in the final stages of the match to lead the Royals to a 2-1 victory over 10-man OKC Energy U23. A red card by Romiliio Hernandez near the end of the first half put the visitors in the hole, but they managed to take the lead in the 63rd minute when substitute Llewellyn Evans scored. Nenad Markovic’s 60th minute goal was enough to send Corpus Christi FC to a 2-0 victory over Houston FC on Friday. Patricio Botello scored his 5th goal of the season and added an assist to complete the win. 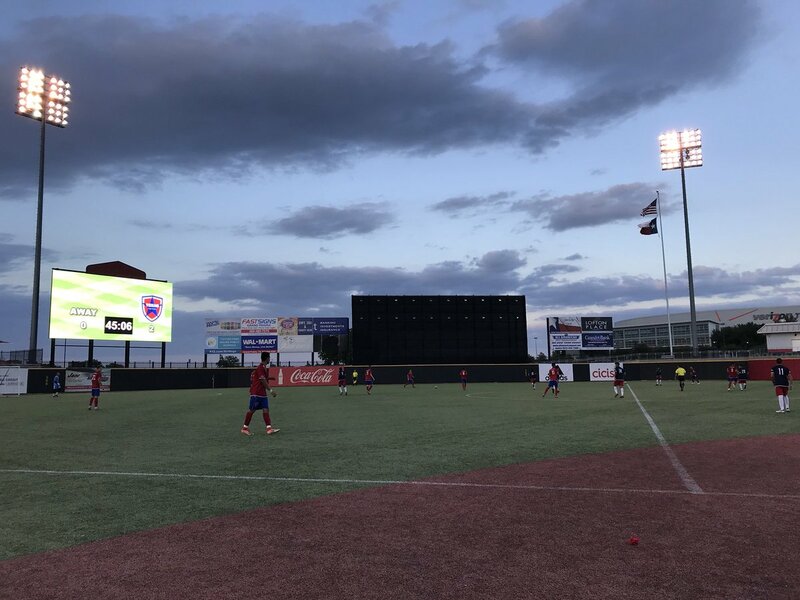 A hat trick from Julio Vargas, who now has 9 goals on the season, led Texas United to a 5-1 home rout over FC Cleburne in the North Texas rivalry match. The two teams will meet again on Monday in Cleburne. This was Texas United’s first win since May 25, after starting the season with three consecutive victories. 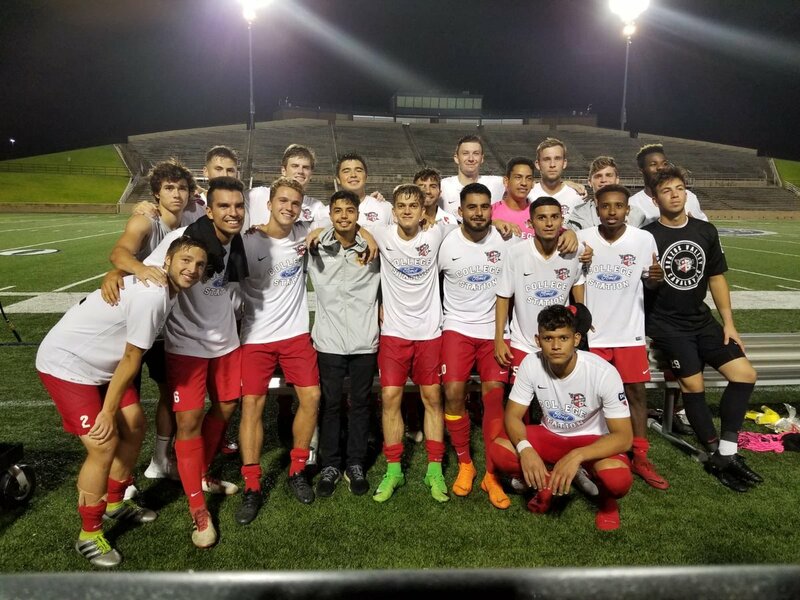 Second half goals from Stanley Smith and Nenad Markovic were enough for Corpus Christi FC to complete their second shutout win of the weekend 2-0 over visiting Brazos Valley.